In AFS, we provide a powerful Online Code IDE based on Jupyter to develop your analytic on the cloud. The $auth_code is an environment variable from Online Code IDE, and the purpose of $auth_code is authenticating with AFS to use AFS functions in your analytics. 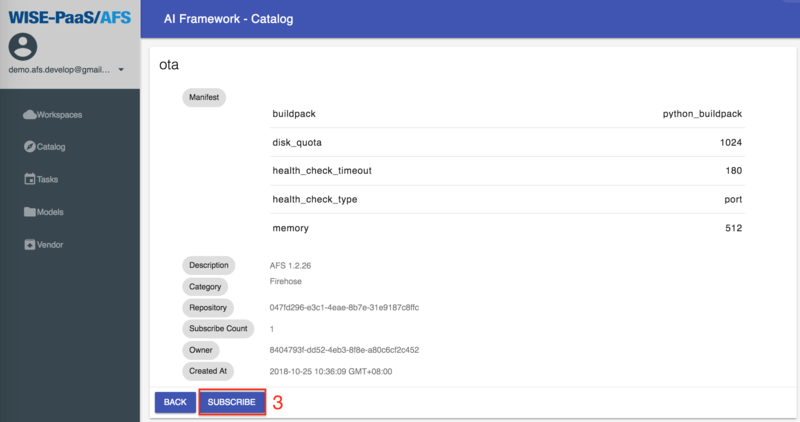 In Online Code IDE, you can define some customize configurations like memory, disk, or requirements for your analytic by declaring a manifest at the first cell. When coding the analytics, and need to use the AFS SDK package, we can add the required package in the “requirements” of the manifest. In this example, memory and disk_quota are also assigned to 2048MB. If set memory or disk_quota as int type, the default unit is MB. Or, use str type and you can specify the unit in M, MB, G, or GB. Note: The default value of disk_quota is 2048MB to avoid insufficient disk space when installing modules. If you set disk_quota less than 2048MB, the value will be overridden to 2048MB. The requirements are the most important part in analytic develop. As native python develop, when you need some external modules, you can use requirements.txt to record all dependencies of your analytic. (More information can be found at pip docs.) Provide a list of requirements can obtain the same effect when developing analytic by AFS. The Type is used to declare this analytic is an APP or an API. In default, all analytic will be assigned as APP type. But if you want your analytic serve as an API (and also write in any web framework), you need set type to API to host your analytic on WISE-PaaS. Enter the custom name of the analysis module, and press NEXT to confirm. When the newly established development & editing page appears in the workspace, it means the module has been successfully created and you can write the analysis module using Python programming language. After filling in the program code, you can click the icon to save it. Next, click SAVE button to push analysis training model application to the platform in the form of an App. This APP will show in Workspace list when completely deployed. In python develop, we can use pip install $MODULE to install all required module. But in a private cloud, there is no any external internet resource can be used, including PyPI. This restrict force all required modules should provide an offline distribution file in the private cloud when developing in Online Code IDE and save the source code to an analytic app. This section will provide an example to use Vendor of AFS to install a module in Online Code IDE. Assume the module is already uploaded to AFS, if not, please reference documentation of Vendor to upload module. Note: When using Vendor of AFS to install a module in Online Code IDE, we must add the module in the requirements of manifest, please refer the manifest section. Right-click on the module and copy the url. Here is an example to create Analytic API by Online Code IDE. Step 1: Create a new Online Code IDE, please name it training_dt_model. 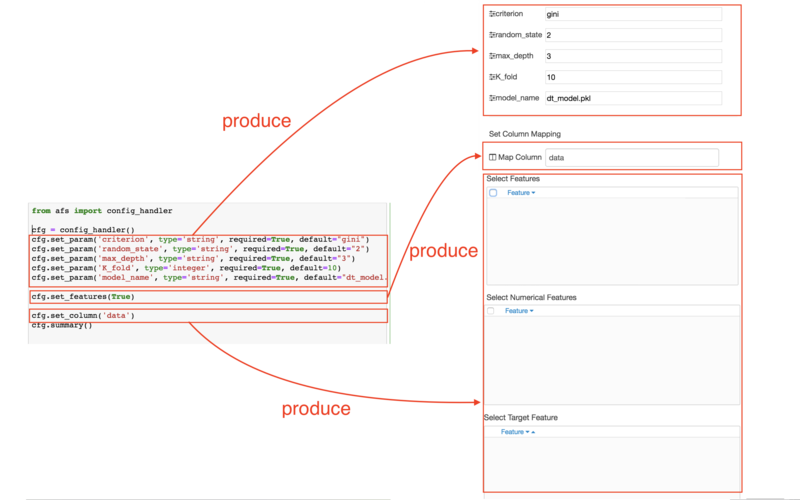 About the detail, please refer to the Create analytic with Online Code IDE section. Step 2: Declare the manifest. Declaring the manifest at the first cell. About the detail, please refer to the Manifest section. Step 3: Setting parameter of the analytic method. 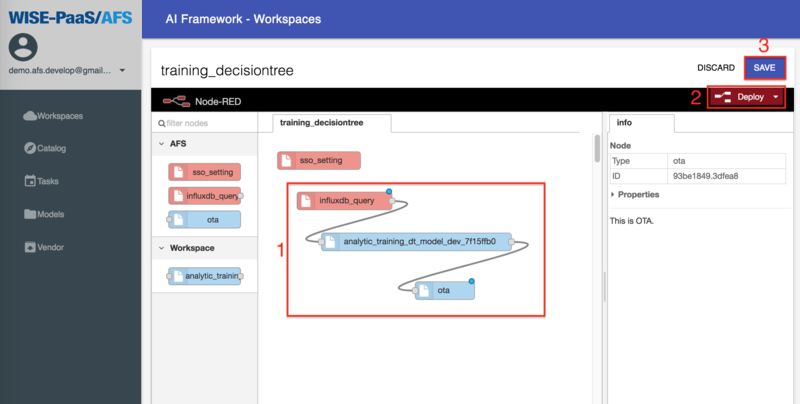 (We use the decision tree method for the example) In Online Code IDE, you can create a node on Node-RED by SDK, and you can provide the Hyper-Parameter Tuning for user. The following code must be at second cell. Note: When editing is complete in this cell, you must run it. Describe the features that the SDK can produce, here is an example of Decision Tree. # # The printing is the API response. (i) Click the icon is in upper left corner. (ii) Click SAVE, and we are uploading the Analytic App now. Wait a second, we can see that it’s successful to upload. Pre-condition: Before creating a solution, there are preparations we must get ready. In the beginning, subscribing ota node and influxdb_query node from Catalog is required. Now, we subscribe the ota node firstly. Step 2: Click ota’s DETAIL. Step 3: Click SUBSCRIBE, and we subscribe the ota node successfully. Next, we subscribe the firehose node. Step 5: Click influxdb_query’s DETAIL. Step 6: Click SUBSCRIBE, and we subscribe the influxdb_query node successfully. 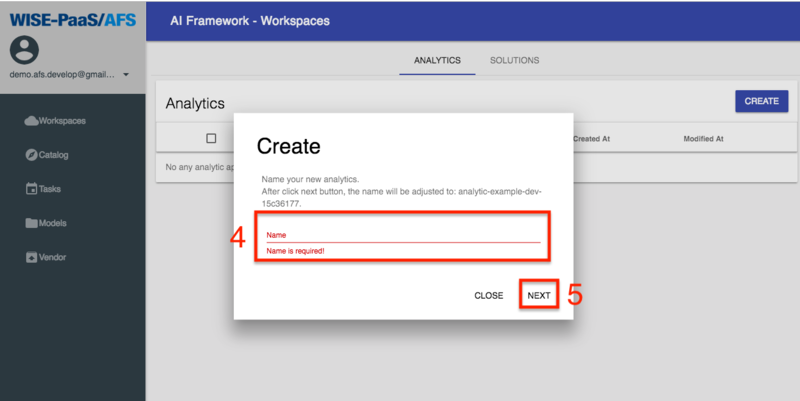 Step 7: Click Workspaces, go back to workspace. After subsribing the nodes, the system will rederect to the Analytics page. Wait a second, the Analytic APIs are created successfully. Now, we start to create a new solution. Step 4: Enter the solution name. Step 5: Click CREATE to create the solution. Step 6: Click EDIT, and the online flow IDE is shown, and we can start to create the flow. In the Pre-condition step, we create ota node and influxdb_query node. As the example in Example of Code IDE, we create a Decision Tree node. The sso_setting already exists. Now, we have sso_setting node, influxdb_query node, training_dt_model node, and ota node. How to create training_dt_model node, please refer Example of Online Code IDE above. You need pull four nodes such that sso_setting, influxdb_query, training_dt_model, and ota. Step 1: Enter SSO User and SSO Password. Step 2: Click DONE to save and exit the setting. Step 1: Choose Service Name, Service Key, and enter Query condition. Step 2: Click DONE to save your setting. Step 1: Enter parameters to training model. Step 2: Select features to training model. Step 3: Select numerical features. 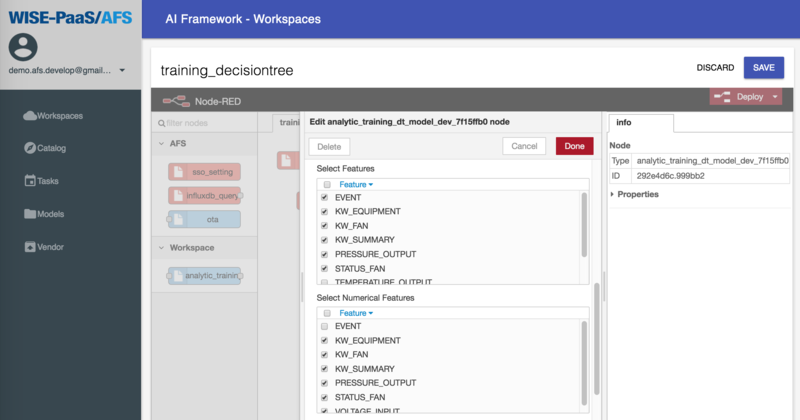 Step 4: Select target features to training model. Step 5: Please click DONE to save your setting when you complete the setup. Step 1: Choose Device Name and Storage Name. Step 2: Please click DONE to save the setting when you complete the setup. Step 1: Connect nodes, influxdb_query connection training_dt_model and training_dt_model connection ota that like the image below. Step 2: Click Deploy to save Node-RED. Step 3: Click SAVE to save solution. We create the solution successfully when it shows Update complete in the bottom right. © Copyright 2018, Jacobchen Revision 9040c04c.